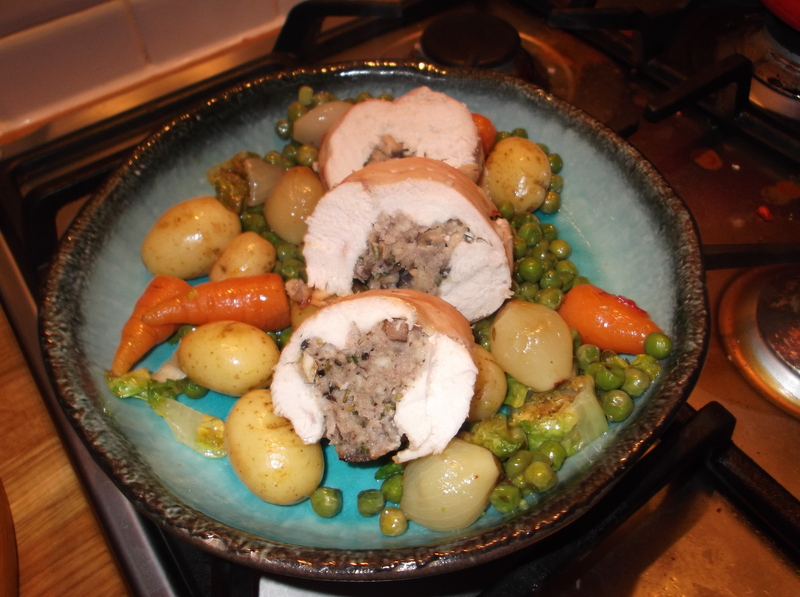 I’ve stuffed the chicken with a mixture of sausgaemeat, sauteed mushrooms, fresh rosemary and thyme and a small handful of breadcrumbs. I squidged this mixture together with a little salt and pepper and stuffed into a battened out chicken breast and roasted in the oven for 30 mins until cooked through and browned. The pea ragout was lovely and worth trying. You could substitute peas for broad beans, or add some stem broccoli instead if you are Marie! boil the potatoes, onions, carrots and peas until tender. I started with the potatoes and added the other veggies a bit at a time. Drain well. heat a little olive oil in a large saucepan and saute the veggies until they are a little golden. Add the stock and simmer until the stock had reduced by 2/3rds. stir in the lettuce and cook for a couple of mins until it wilts. serve with the chicken sliced on top. The original recipe sautes some bacon lardons at the beginning, before you add the veg to the olive oil, and I think that would have been tasty, but I didn’t have any bacon in so we went without!